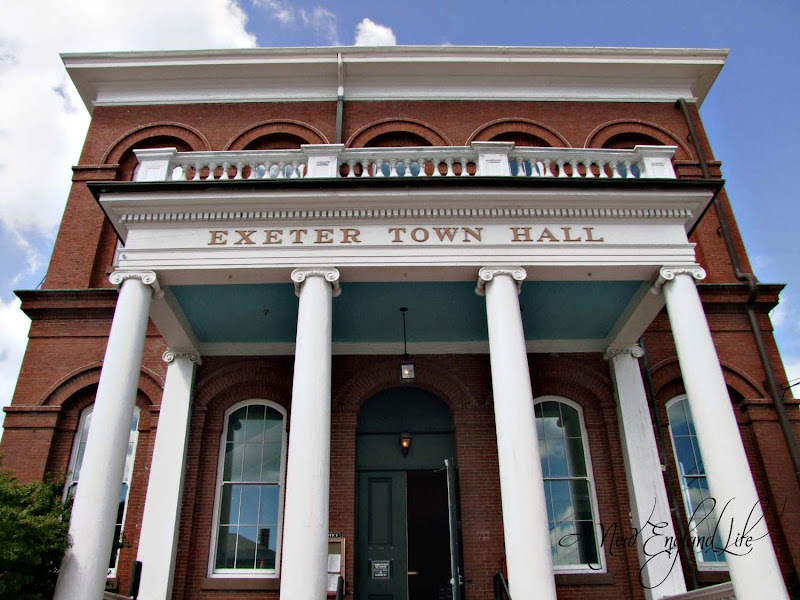 Here we are in my local town, Exeter, NH, standing on Front Street looking up at the old Town Hall. You can't miss it as you're driving through the center of town, it's an historic old building that really makes a statement. The day I was there shooting they were working on the cupola. No one was up there at the moment because it was around lunch time so they must have been taking a break. Apparently the bandstand in the middle of town needed a little roof work too! After all, winter is coming and now is the time to get this stuff done. Headed up Front Street towards Phillips Exeter Academy and the leaves are a changing! Seeing as how this was over a week ago I'm sure they're even more colorful now. Now we're on the campus of PEA (Phillips Exeter Academy) looking down a long, lovely walkway. At the time the kids hadn't returned to school yet so it was fairly quiet except for all the workers trying to finish up last minute restorations. Did you know PEA is one of the most prestigious prep schools in the country? Kids come here from all over the world. The oldest dormitory on campus. I'm not sure if it's still used as a dormitory but it certainly is pretty! I hope you will join Mary and many other for Mosaic Monday! Lovely shots of Exeter. I especially enjoyed the campus of PEA. Gorgeous secret garden! Oh, it's so good to have a new post from you...I've missed your wonderful photography. I have been to Exeter and it is a lovely town and campus. Fall is in the air. So good to see your pictures. Lovely photos! 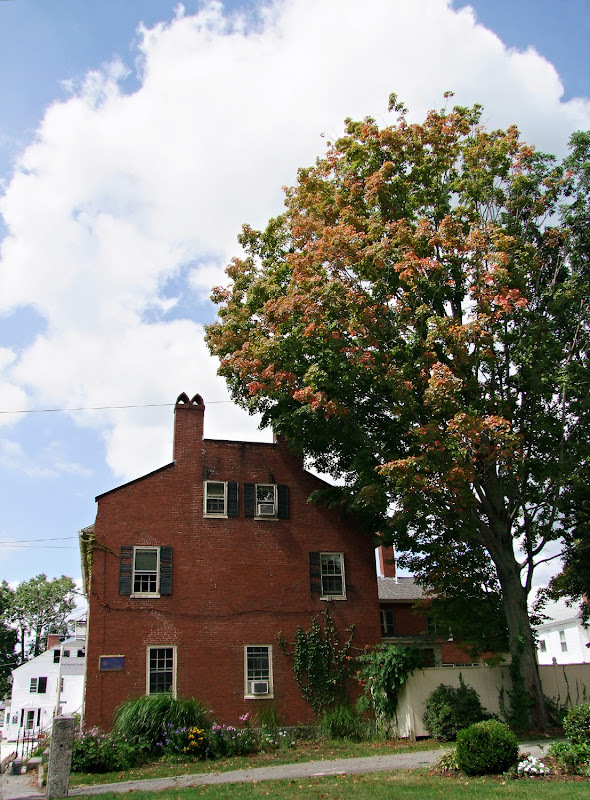 Exeter is the quintessential New England town! Gorgeous. 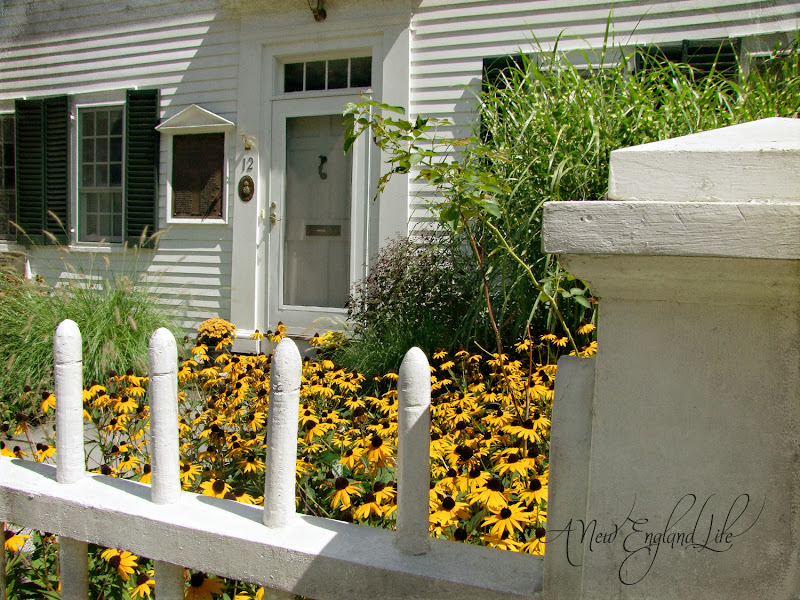 I love the old homes and schools in New England towns - so charming, and so homey. Beautiful pictures of your hometown. Love the last shot of the sunflower. Have a great week. Oh, be still, my heart. What an absolutely beautiful post, my friend. I love seeing the photos of the old homes and buildings - what a beautiful campus. Thanks for sharing your photos with us. I love old historic towns and yours is absolutely beautiful! What a lovely stroll through town and your mosaic with the dahlia is fabulous. Thank you for this lovely walk around your town - beautiful images. 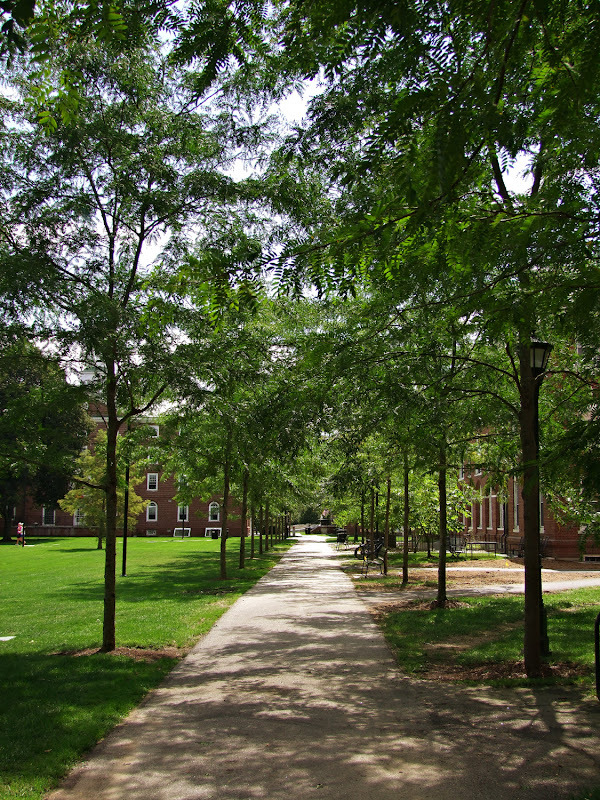 I love the look of old school campuses with the tree lined walkways. So beautiful! I can just see antique shops and quaint places to eat lunch! So pretty! It was a lovely tour; thank you. 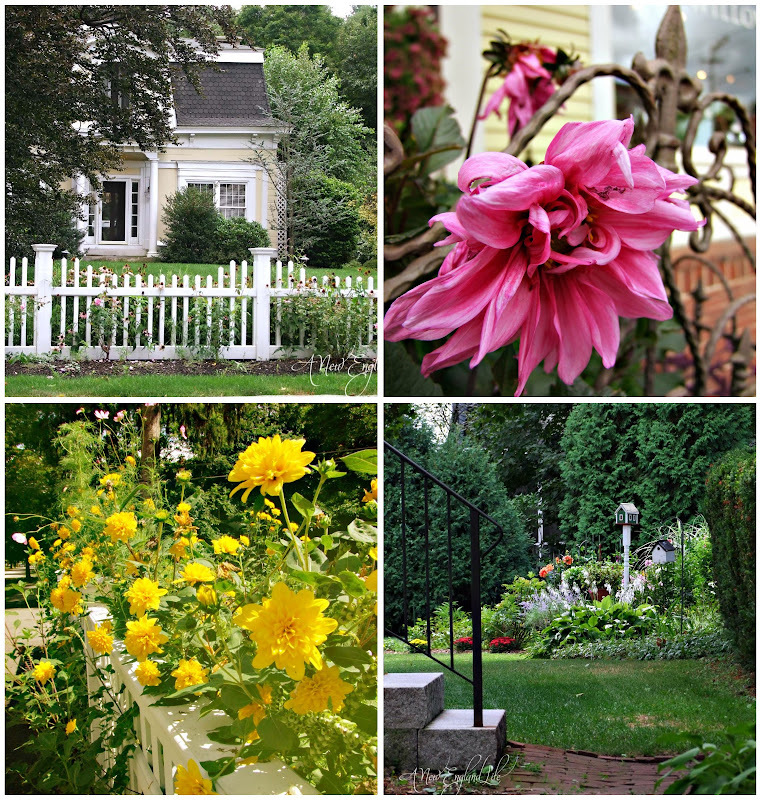 I love the old red brick buildings, the white picket fences with yellow flowers, the long walkway! Wow, Exeter is so pretty. You're right, PEA is a really good school. I went to an Ivy League university for college and many of the guys went to Philips Exeter. Gosh, it could be used in a movie set, it is so perfect! Gorgeous little town. What a beautiful, historic town! Great shots! Lovely photos of your hometown. I might do something similar with Miami. Maybe someday I will finally be able to visit New England. It seems to be so lovely. I find this town utterly charming and somewhat similar to the small towns in my part of the country. The architecture is a little different, but the feel is very much the same. Very enjoyable photos. Hi! 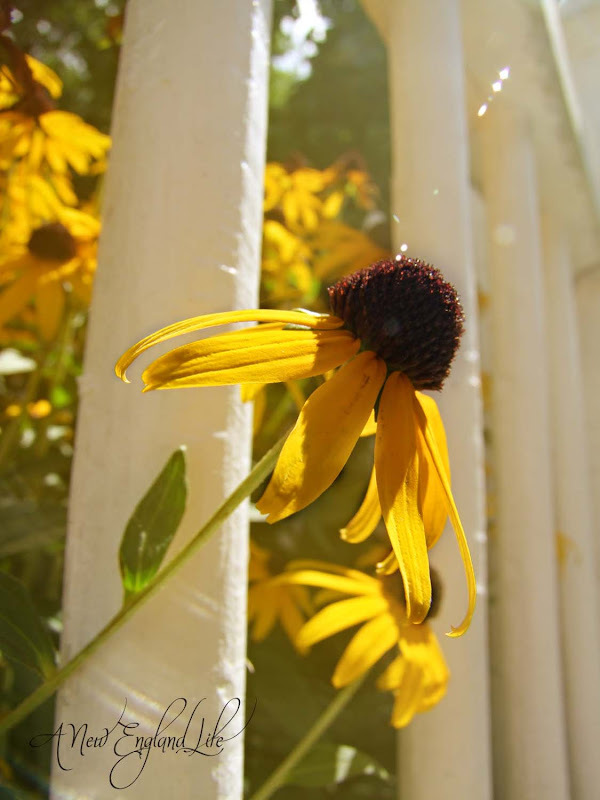 You have a beautiful blog, love your photos! Thanks so much for tips about Portsmouth in our traveling planning. We are just back and we stayed in Portsmouth for a week, we thought the town, it`s surroundings and beautiful neigborhhods where all great. Strawberry Banke was great, and so was New Castle. A beautiful town we`re we want to go back some time! What a lovely, stately looking community. You always have the most lovely photos!